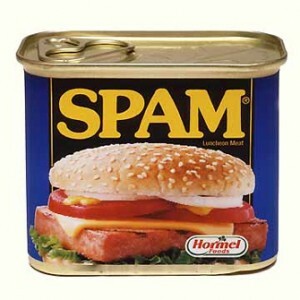 Spam Arrest LLC, which provides the popular web service software to eliminate email spam, hopes to end its four year legal battle against Hormel next month. Spam Arrest is the only company ever, except Hormel Foods Corporation, to secure a trademark including the word “spam” recorded on the principal United States trademark register. For nearly four years, Spam Arrest has defended its trademark against Hormel’s lawsuit seeking to cancel the SPAM ARREST trademark registration…. There you have it, canned and virtually inedible. A ridiculous three-and-a-half-year crusade meant to “take back” trademark rights arguably never earned under the guise of trademark dilution, the law that made trademark a right in gross for the privileged few; a claim — quite credible — that many smaller companies have simply folded their tents rather than defend their businesses, the very essence of IP enforcement abuse; an utter absence of LIKELIHOOD OF CONFUSION; certainly no evidence of damages and every reason to believe that the coinage of “spam” for junk email has done more to build this brand than anything, including Monty Python, could ever do; and a half million dollars donated to America’s most deserving (and, I might add, most handsome) sub-class of learned professionals. The Trademark Trial and Appeal Board, the federal administrative court charged with overseeing the national trademark office, has decided to hold the final hearing for case number 92042134, Hormell vs. Spam Arrest, before a live audience of trademark lawyers in New York City. The hearing will take place at the Practicing Law Institute in New York on February 23, 2007. Now that is fascinating. Here’s a link to the schedule for the PLI course featuring this live argument. I’d attend in a second if I had been one of the torchbearers for Spam Arrest’s commitment to principle, freedom and justice. Since I’m not, I’ll have to use the $1,295.00 course tuition and buy things like food. Not Spam, of course. Nothing personal — doctor’s orders.